As summer sets in, your home might feel too hot for comfort. While you might want to dedicate your weekends to trips to the beach and shopping malls, you can give your home’s comfort level and energy efficiency a boost by spending a few hours on home improvement. Keep your Edgewater, Maryland, house cool with these simple weekend projects that help to take the pressure off your air conditioner. While a ceiling fan won’t lower the temperature in the room, it will help you feel cooler because of the air movement. Some homes don’t come equipped with ceiling fans, so pick one up at the hardware store and have your trusted technician take care of installation. Focus on rooms where you spend the most time, such as your living room, kitchen, and bedroom. Ceiling fans come in so many different designs today, you are sure to find one that is energy efficient and aesthetically appealing. Maybe you prefer to leave your windows free and clear instead of covered with treatments like blinds and drapes. The summer sun can turn your house into an oven, however, so consider covering the glass with tinted window film. You’ll still get plenty of natural light and be able to enjoy the views from your living spaces, but the sun won’t create as much heat. There are many simple and inexpensive window treatments that can be installed in no time and that will help to greatly reduce heat gain. 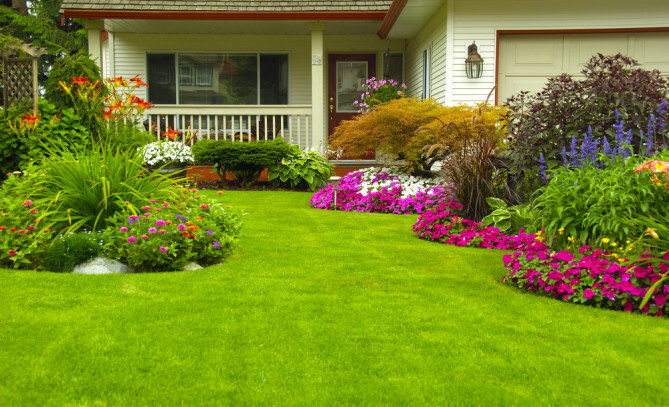 The family dog might enjoy a wide expanse of empty lawn, but landscaping your garden with plants and shrubs will help keep your house cool. Plant a shade tree to shield your house from the sun and use shrubs or hedges to keep UV rays off your windows.